Pass the salsa and the bean dip, please! It’s time to try the latest chips. They’re crunchy and healthy. There’s just one little catch: They’re made from jellyfish. Few people in the west clamor for jellyfish. The slimy texture just isn’t very popular. And many people know that jellyfish tentacles can contain some nasty venom, which hardly helps its reputation. In Asia, though, jellyfish are a delicacy. Their bodies, known as bells, are brined for several weeks in a combination of salt and alum. That dries the jellyfish out, giving them the texture of a pickle. A researcher in Denmark wondered how that happened, and if the jellyfish could be processed in other ways. So he and a team of other scientists took at stab at it. They studied the jellyfish under several types of high-tech microscopes to see what happened as they were dried out. And instead of using a salty bath, they used ethanol -- the type of alcohol that’s used in gasoline blends. 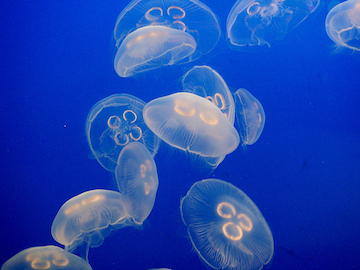 The alcohol replaced the water in a jellyfish’s body. In a few days -- much less time than conventional processing -- the alcohol evaporated, leaving the jellyfish ready to eat -- as crunchy chips. The chips are rich in vitamin B12, magnesium, phosphorous, iron, and other minerals and nutrients. And jellyfish populations are growing, so there are plenty of them around. Frito-Lay hasn’t started packaging them yet, though. So it might be a while before we’re digging into our favorite queso recipe with a crispy jellyfish chip.